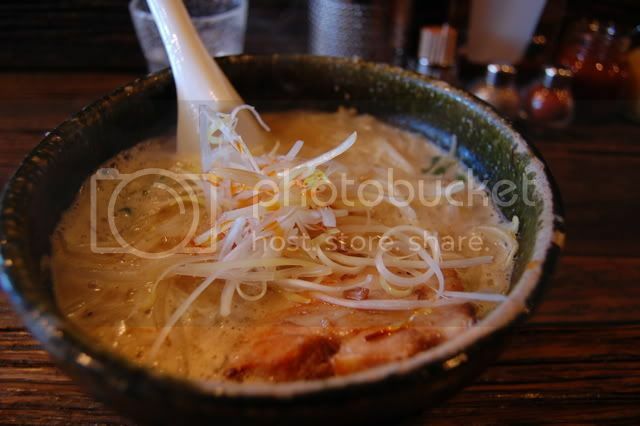 If you have a list of the top 30 ramen shops in Japan, you gotta start at #1, right? I mean, I haven't seen that Cloverfield movie, but Tokyo could blow up tomorrow and I'd be stuck with the taste of, gasp, #25 in my mouth. Near Ichigaya station, just cross to the north side of the river and walk east for about 5 minutes. This place is interesting. The master is very serious. The key here was the amazing miso broth. A few different kinds of miso, cooked over high heat to reduce it all down. Matched with great chyaushu (pork) and noodles. All the details were accounted for, even the glassware for your water was unique. At the end of your meal, the staff brought a shot size glass of ice cold green tea. Damn, I want to go there now. Think it's open at 1am?